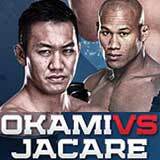 Review: 2013-09-04, nice heavy punches but it is not enough: Yushin Okami vs Ronaldo ‘Jacare’ Souza gets two stars. Yushin Okami (29-7-0, 48% finishing rate) entered as the No.4 middleweight in the world while Ronaldo ‘Jacare’ Souza (18-3-0, 84% finishing rate) entered as the No.6 (currently the #1 in this weight division is Chris Weidman). Okami vs Souza is on the undercard of Glover Teixeira vs Ryan Bader – UFC Fight Night 28. Watch the video!